Book Club 2 meets the third Thursday of each month at 1 PM. 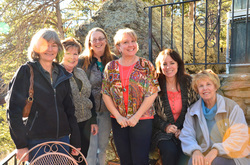 Our members take turns hosting the group in their homes, and the hostess provides light refreshments. We read a wide variety of books including fiction, historical fiction, biographies, non fiction, mysteries and adventure novels. We maintain a list of books that have been suggested by members, and periodically vote on the list to select books for upcoming months. After a book is selected for a month, the person who suggested it usually leads the discussion. We are easy-going and have a lot of fun together. Feel free to join us or visit us and see what you think!